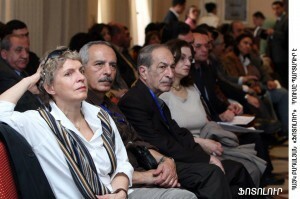 Today was the opening session of an international conference organized by the ARF in Armenia titled “Socialist Approaches to Armenia’s Challenges: Global Perspectives, Local Realities.” The two-day gathering includes both Armenian and non-Armenian delegates from around the world who have converged in Yerevan to discuss workable solutions to Armenia’s challenges. Below is video of the opening day of the conference, as well as commentary by Dr. Karen Khanlarian (editor of the ARF’s official organ Droshak) and Artsvik Minassian (ARF Parliamentarian). They speak about the need to inject socialist policies into governance in Armenia as the key to solving the pressing socio-economic challenges plaguing the nation. Rather than simply leaving the free-market to run wild, they propose shaping policies on the basis of such core human values as freedom, solidarity and social justice.